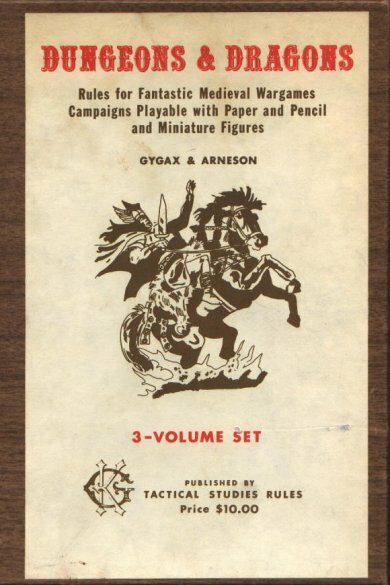 Happy 40th Anniversary, Dungeons & Dragons! Fascinating stuff – Jon Peterson, the D&D historian, has picked January 26th, 2014 as the 40th anniversary of the original D&D set. The actual date is a bit fuzzy, but late January seems to be the consensus as to when the game was available to the general public. Of interest to me when I read that post was this bit of text from the El Conquistador postal fanzine in February of 1974, stating “One may find a game in progress on a Sunday afternoon at about 1:30. Visitors are welcome.”, then proceeds to give Gary Gygax’s home address. I wonder if anyone ever took him up on that invitation? In any event, I just recently acquired the Original D&D Reprint, so I think I’ll celebrate by running a game this weekend.